LST original Shiromuku (=all white kimono) exclusively designed for Kiyomizu-dera Temple wedding. The costume is designed with “Otowa-no-taki (water fall)” which is known as the origin of Kiyomizu-dera Temple, “Kiyomizu-no-Butai (Stage)” and “Koyasu-no-toh (Tower)”. It took about half a year from designing to finish the costume. 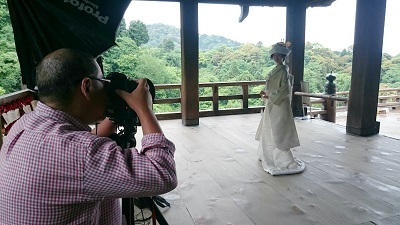 We conducted photography of wedding costume at Kiyomizu-dera Temple from 6:30 in the morning. I am so happy and grateful that I could be involved with the creation of this costume. I would like to give my sincere gratitude to Kiyomizu-dera Temple, photographer and hair & make-up artists. The video of this photography can be watched on LST Instagram and Facebook.